There are two broad schools of piano trio music in Europe, one influenced by the Esbjorn Svensson Trio (e.s.t.) who took Thelonius Monk as inspiration, and the other dominated by Tord Gustavsen whose work is in the same school as Bill Evans. Michael Wollny is a young German jazz pianist who while clearly intimate with the works of both these Scandinavians is beating his own signature into the oeuvre and getting better all the time. This album is actually one half of a pair, the liner notes concentrate on the other half Oslo where this trio played with the Norwegian Wind Ensemble, an improvising orchestra no less. An experience that clearly inspired Wollny to push himself and the band to new levels of exploration. 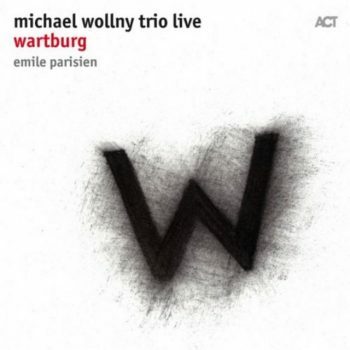 Wartburg on the other hand is Wollny with drummer Eric Schaefer and double bass player Christian Weber for the first seven tracks, then on the last four they are joined by soprano sax player Emile Parisien. Wollny had met Parisien a long ago but hadn’t played together until they found themselves onstage as a duo for a totally improvised concert in Germany in 2016. An experience which lead to Wollny inviting Parisien to the Wartburg castle in Eisenach, Germany for this performance. The story goes that the engineer Adrian von Ripka had just one hour to set up the microphones and do a soundcheck before the concert, it’s a testament to his skill that the result is so good. This is a deep, dark recording with a richness to it that few manage in any circumstances, it’s so quiet that it could be a studio production but the space and atmosphere, not to mention two outbursts of applause, reveal that it’s the real thing. The playing however is the real giveaway, it has a tension to it that you don’t get when mistakes can be erased with the click of a mouse. They start off quietly with the Gustavsen esque Atavus, but quickly differentiate themselves with lovely solid double bass, deep kick drum and a velvet atmosphere, but this isn’t aimless noodling, Wollny provides a melody that gives the piece direction. The beauty continues with Big Louise where shimmering piano and brushed cymbals lull you into expecting a gentle ride, a sense that’s quickly upended by Perpetuum Mobile where the intensity is cranked up with big dynamics and visceral playing that typifies the next few tracks. If you like your drum and bass acoustic and palpably real this will be the highlight but Interludium and Gravité introduce a more torquey sophistication to proceedings. Parisien joins the trio for Bob Brookmeyer’s White Blues, a lyrical piece that suggests we are in for a charmed ride, but again this is misleading, when Tektonik comes along it lives up to its title with muscular playing from the trio and the sax player delivering a middle eastern sound that contributes to a multifaceted groove of considerable drama. We get a short break at the beginning of Engel before the band builds up to an incendiary climax that leaves you breathless and ready for the gentle denouement of Make A Wish. This is a remarkable performance that has been superbly captured, if you can make use of the high res download that’s available I’d highly recommend it.